The in basket: Asplundh Tree Experts have been conspicuously busy along Mile Hill Drive in South Kitsap the past few weeks. They began, it appeared, on Baby Doll Road a few feet off of Mile Hill Drive where they spent at least two days removing branches if not entire trees. They definitely appeared to be taking down entire trees next to the Abbey Lane apartments just downhill from Harrison Avenue and then went into full tree removal mode just downhill from Jackson Avenue the first week of this month. You often see Asplundh crews limbing trees as part of Puget Sound Energy’s ongoing vegetation management program to prevent weather-caused power outages. But this was clearly a lot more than than. The out basket: Indeed it is, says Lindsey Walimaki of PSE. It’s the middle part of a $9 million transmission line-substation upgrade to help curtail power outages in the Manchester area. The substations on Mitchell Avenue and Woods Road have been improved and now work has begun on a new four-mile transmission line that will cost $4 million of the total. It will run along Mitchell Avenue, Mile Hill Drive, Baby Doll Road, Collins Road and end at the substation just east of Collins on Woods. distribution lines. The tree work will continue into April, and the new wires should be strung and in service by June, Lindsey said. It all includes upgrades at the Long Lake substation too, with that work scheduled from April to July with transmission line work there in July. Unfortunately for wood gatherers, the wood isn’t available to the public, she said, though private property owners can keep that which is left on their land if they wish. Perhaps a person could make a deal with the property owner. The rest is hauled away. You can read a lot more about the project and five other ones PSE has under way or about to start in Kitsap County at its Web site, www.pse.com/ Click on kitsap at the bottom then Construction Projects in the box on the left of the window. Most don’t involved a lot of tree work, but there is a pilot project in the Wildcat Lake area of Central Kitsap, and along Seabeck Highway south of Holly Road. That area is hard hit by power outages, Lindsey said. So the company will experiment will taking limbs above power lines that might fall on them in a windstorm, rather than it’s usual practice of just removing limbs that have grown within reach of the wires. Three of the other projects described on the Web site are on Bainbridge Island and the sixth is at a substation between Bremerton and Gorst. 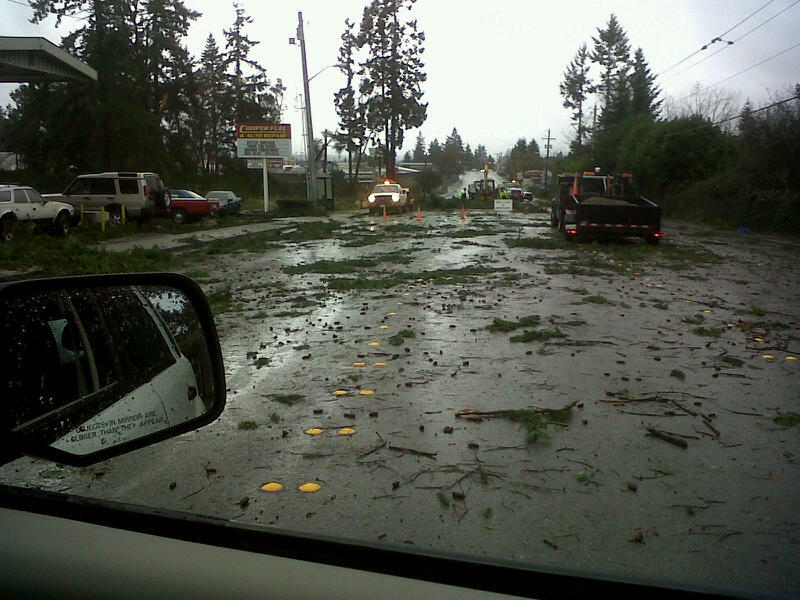 Was it a tornado that closed Wheaton Way Tuesday? The in basket: Mike Brown, who had to travel back and forth between East and West Bremerton Tuesday in his job as development project manager with Bremerton Housing Authority, spent a lot of time in the traffic jams around the prolonged, complete closure of Bremerton’s busiest street, Wheaton Way, while power crews worked to clear a huge tree and other debris from the street. The closure went on for hours, from about 12:15 a.m. to just after 7 p.m., around 19 hours. The detours were congested, and drivers trying to get through, including Mike, tried side streets that didn’t work and l had to wait to get back onto the designated detour among drivers who weren’t very cooperative about letting them in, he said. The mess could have benefited from some police officers on foot in the worst intersections, he said, especially Halvorsen Avenue and Sylvan Way, so cars didn’t have to wait for passing traffic on Sylvan to pull out. As it was, traffic on Halvorsen backed up for blocks. The out basket: This was an extraordinary event about which not much has been printed or aired. Davina Gruenstein, of Puget Sound Energy says the company thinks it actually may have been caused by a tornado, a view shared by an occupant of a nearby business building at the time. Some people are describing the scene near Flowers to Go and Cooper’s Fuel and Auto Repair as like a war zone, she said. A huge tree fell across Wheaton, she said, dropping wires on both sides of the four-lane street and snapping off two power poles. Broken limbs littered the pavement. Just removing the tree took a long time, she said. The poles had to be replaced. cross-arms attached and a thousand feet of wire restrung. Lt. Pete Fisher of Bremerton police tells me they don’t have the manpower to assign officers to direct traffic, even in such an emergency. They had no reserve officers on duty. They wouldn’t have been able to respond promptly to accidents and other wind-related problems had they added traffic control to their duties, he said. The Road Warrior came upon the blocked street about noon and I phoned CenCom to suggest the traffic signals be retimed to handle the detoured traffic. They appeared to be set for normal traffic. Lt. Fisher said he did the same between 1 and 2 p.m.
Jeff Collins, head of city signal shop said they did that at Sylvan Way early in the day, but the press of wind-related problems kept him from giving Sheridan Road more time to turn left onto Wheaton until about 3 p.m.
Pete added that they got the state to delay that night’s scheduled closure of Manette Bridge because of the Wheaton Way crisis. Mike Brown said he eventually was able to devise his own way around the backups. It helped to know your way around. I got caught in the Halvorsen backup around 2:30 but turned right onto 31st and found Olympus Drive one block up the hill to be mostly clear. Mike said he found the same thing. Dennis D’Amico at the National Weather Service said they have no reason to believe it was a tornado. But the kind of thunderstorm squalls that moved through the area about when the tree fell can do that kind of damage, he said. Jason Hood, a manager at Cooper’s, isn’t convinced. He was doing late-night paperwork when the wind hit and said it was”fairly instantaneous and slammed against our building,” lasted 15 or 20 seconds and made him worry that it might peel the walls right off, he said. As it was, the roof of another part was torn off, he said. The wailing of their security system when the power failed and blue sparks from power transformers blowing out as the tree crashed across the highway added to the chaos, he said.